Howdy! “Can you ride a horse?” “Yup.” I said the magic word... Presto! Instant TV cowboy... or not. You can fool the suits. You can fool some of the people. You can even fool yourself, but you can’t fool your horse. He knows. Riding a horse isn’t like riding a bicycle. When I was in the circus I noted that jugglers practiced their skills daily, outside the big top as well as inside the ring. With a horse it’s hours in the saddle. Worked with Bob Steele once. Aces in my book. He told me during his Hollywood heyday he just kept getting on and off his horse. Time after time after time. I think he was trying to tell me something. When I was ten my dad took me to a ranch in Mancos, CA, where he taught me ropin’, ridin’, shootin’... and throwin’ up at roundups. I thought I was Hoot Gibson forever. WRONG! A Sugarfoot is a feller workin’ his way up to be a tenderfoot. That’s not all that was tender when we shot the “Sugarfoot” pilot. My horse, Sickle, must have been part mule, or he read a different script from mine. We were never on the same page. Hence, we had to use a lot of trickery to create the illusion I was one with my hoss. (A) A foot stool for my mounts. (B) We filmed the scenes of Sickle ‘n me many times from many different angles so the editor could cut out all the humiliating stuff and blend the few good moments together. (C) I’d get up on a jiggling ladder, camera tilted skyward. Crouching cameramen skittered past me, tree branches held high to make it look as if I were ridin’ hell bent for leather. (D) Lots and lots of stock footage. By some miracle, Sickle and I made it through that show intact. By another miracle the show sold. 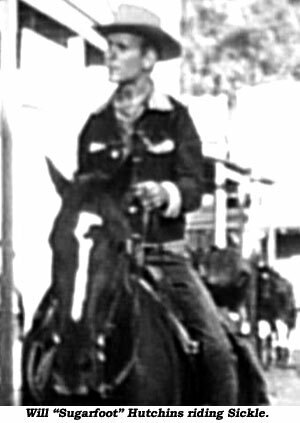 Before we filmed episode 2, “The Reluctant Hero”, Warner Brothers sent me over to Pickwick stables in Burbank for intensive lessons in horsemanship under the able tutelage of Emile Avery. He started me from the ground up. I had to clean the stables. After two weeks of galumphing up and down the hills of Griffith Park, Emile and I were rarin’ to show Sickle over at WB what I’d learned and who was master. On my first day back at work, Dennis Hopper, who played Billy the Kid, moseyed on down to our set to wish me bon voyage. The director yelled action, Sickle made his move, and I abruptly found myself in the dust on the seat of my jeans. Dennis let out a whoop. Hmmm... Billy the Kidder. Well, folks. that’s pretty much how it went all that first season. I only remember one good mount and ride-off all year and that’s because Sickle just happened to be going in the correct direction. Every time Sickle and I endured one of my pathetic hippity-hop mounts and sessions aboard, the cowboys would greet me on our return with tsk tsks and advise me to save my money. For our second season, to the end of the trail, the boss wrangler, Ace Hudkins, took mercy on me and replaced Sickle, that big Galoot, with sleek, speedy, beautiful, copper-colored Penny. It was love at first sight. I don’t know how Penny felt. Ah, Penny, half Quarter Horse, half thoroughbred; and when I eased myself up into his saddle I felt I was ridin’ on the wind. Sadly, we never left the cramped back lot where the western streets and trails were located. When we got up to a good gallop we’d have to whoa pronto, lest we hit the back fence. Wish we could have filmed a few episodes out at the Warner Ranch. Then we really would have gotten acquainted. Yep, Penny was a whole lot sharper than I (and most of the execs), and he sure made me look better than I was. I figure Sugarfoot was a natural born sidekick looking for a hero. I didn’t realize at the time that I was sitting on him. Penny was my best pal at Warner Bros. A week doesn’t go by when I don’t think of him. He never got any billing. The bosses would have had to give him more hay. But I put him right up there with Trigger, Champion, Tony, Topper and all the others in the Pony Pantheon. So, Penny, up there in Horsey Heaven, I raise a stirrup cup in your honor. Here’s looking at you, kid. You’re the best danged horse I ever knew... Adios!